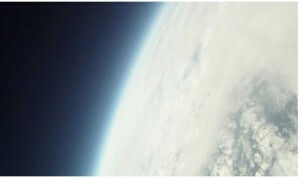 Father-Son send iPhone into Space, it Works! As part of a science project a Dad-Son team sent a capsule attached to a weather balloon into space to record some exciting footage and also be able to recover the capsule. The duo were part of the Brooklyn Space Program. A team designed the capsule which had a Go Pro Hero HD camera with an iPhone which was used to track the craft via its GPS. Luke Geissbuhler headed the team which launched the capsule from Newburgh, NY. The craft was assembled on site and initially climbed 25 feet per second until it reached stratosphere. The capsule had to face 100MPH winds and temperatures as low as -60C. It was shielded and had a hand warmer on the inside to help during low temperatures. The craft kept going up and after 70 minutes and at an altitude of 100,00 ft, the weather balloon burst. The capsule fell at speeds up to 150MPH but a parachute was deployed which slowed the decent. However while the craft sustained high winds and low temperatures, the camera died just shy of 2 minutes before touch down. The iPhone began transmitting GPS coordinates helping the team locate the capsule which was just 30 miles away from the launch point.